This is going to be awesome. 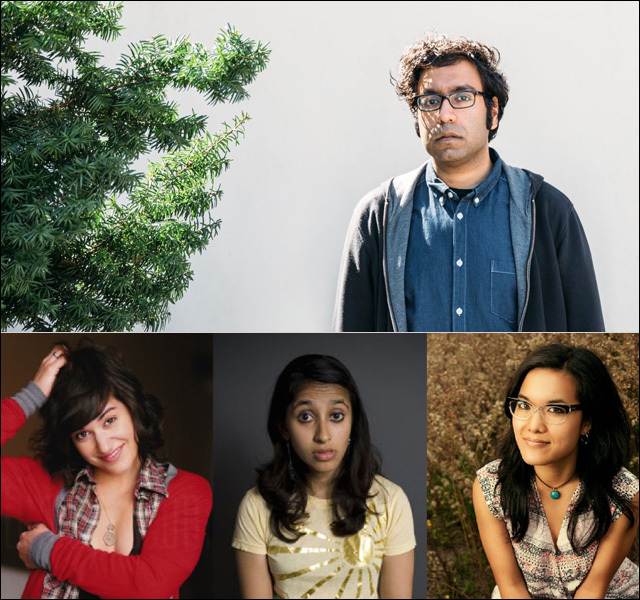 If you're in New York, don't miss the chance to hang out with comedian Hari Kondabolu, the A/P/A Institute at NYU Artist-in-Residence, sitting down to chat with friends and fellow comedians Sabrina Jalees, Aparna Nancherla and Ali Wong. It's happening Tuesday, February 17 at the NYU Kimmel Center. Like I said: awesome. Hari Kondabolu begins his final semester as the A/P/A Institute at NYU Artist-in-Residence by performing new material developed during his residency alongside friends and fellow comedians Sabrina Jalees (Last Comic Standing, MTV’s Failosophy), Aparna Nancherla (Conan, Totally Biased with W. Kamau Bell), and Ali Wong (Tonight Show, Writer for Fresh Off the Boat). Hari Kondabolu is a Brooklyn-based, Queens-raised comic who has performed on the Late Show with David Letterman, Conan, and Jimmy Kimmel Live. He released his debut stand-up comedy album Waiting for 2042 in March 2014. Kondabolu was most recently a writer and correspondent for the Chris Rock-produced FX show Totally Biased with W. Kamau Bell. A former immigrants rights organizer, he is the 2014-15 A/P/A Institute at NYU Artist-in-Residence. The event is free, but it's almost sold out. RSVP here.